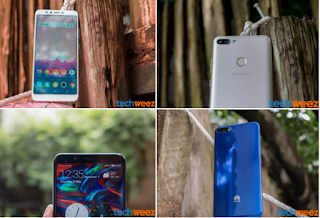 Home » Infinix , Reviews » Infinix Hot 6 Pro vs Huawei Y7 Prime Complete Review, Pricing, Which should you buy? Infinix Hot 6 Pro vs Huawei Y7 Prime Complete Review, Pricing, Which should you buy? This year saw the emergence of two powerful smartphones launched into the Nigerian mobile phones market, the ever buzzing Infinix Hot 6 Pro and the Huawei Y7 Prime. To some smartphone critics these phones are similar but the truth is they are so different in many ways. They both have 720p 18:9 displays, dual primary cameras, front facing flash for their selfie cameras, run Android 8.0 Oreo out of the box and are sold almost at the same price when you consider the 3GB/32GB variants. Both phones sport 18:9 1440 x 720p displays, but that is where the similarities end. The Infinix Hot 6 Pro’s screen has better contrast, better viewing angles and better sunlight legibility. The Huawei Y7 Prime 2018 has a trick up its sleeve: You can change the colour temperature of the screen. I don’t normally like screens with a warm white balance so the Y7 gets points for letting me set the most suitable white balance. Nevertheless, the winner is still the Infinix Hot 6 Pro. It has more merits than the Y7 Prime in this regard. Infinix and Huawei went in different routes for their phones. Huawei gave the Y7 Prime 2018 a 3000mAh battery and Infinix gave the Hot 6 Pro an impressive 4000mAh battery, which is 33% larger than the Y7 prime. As expected, the Infinix Hot 6 Pro has better battery life than the Y7 Prime. The Huawei Y7 Prime has really decent battery life for a phone with a 3000mAH (4-5 hours screen on time depending on usage) but the Hot 6 Pro is the clear winner. I got 5.5 to 6 hours of screen on time easy on heavy days where my location is on and constantly syncing my emails. If you want a phone with great battery life, the Hot 6 Pro is the clear winner. Both phones have similarly spec’d cameras. The Huawei Y7 Prime has a 13MP camera with a f/2.2 aperture lens and a 2MP sidekick camera for portrait mode. The Infinix Hot 6 Pro also has a 13MP primary camera with a f/2.0 lens and a 2MP sidekick camera too. The amount of detail resolved in daylight is the same, although the Y7 tends to shoot photos that are quite heavy on contrast. At night, the Hot 6 Pro has a much brighter flash which is great for shooting objects that are further away. However when it comes to portrait mode, the Hot 6 Pro is the clear winner where it crops in like in normal portrait mode shots and blurs out the background. The Y7 Prime is a bit finicky in this aspect and I was struggling to get a good portrait photo, although that could be thanks to the pre-release software the phone was running. The selfie camera performance was a surprise. The Y7 Prime has an 8MP f/2.0 selfie camera with a front facing camera flash while the Hot 6 Pro has a 5MP with a similar f/2.0 lens but a way brighter front facing flash. Interesting enough, I preferred the front facing camera of the Hot 6 Pro. It looked less noisy with the flash off. Face tracking is good with both cameras, but the Hot 6 blows the Y7 Prime with the much brighter front facing flash. That flash illuminates the face better than the one on the Y7 Prime and it is best for low light selfie or video shooting. Y7 Prime scores points for having a selfie camera with a wider field of view, which is great for group selfies. When it comes to video, both phones shoot at 1080p@ 30fps using the back cameras, so that is a draw but the selfie video situation is different. Huawei decided to limit the Y7 Prime with only a maximum of 720p while the Hot 6 Pro’s selfie camera can shoot upto 1080p at 30fps. In conclusion, the Infinix Hot 6 Pro has the better selfie camera, better selfie video and beats out the Y7 Prime 2018 on portrait mode while using the primary camera. The Y7 Prime with its 32GB of internal storage and 3GB of RAM is priced at N59,000 while the similarly spec’d Hot 6 Pro is priced slightly lower at N47,000. However, Infinix has a cheaper Hot 6 Pro variant with 2GB of RAM and 16GB of inboard storage which retails for N44,000. The Hot 6 Pro is cheaper with similar specs and more accessible to more people with the 2GB RAM/16GB ROM variant. For me, the Infinix Hot 6 Pro is of a better bargain when comapared to the Huawei Y7 Prime 2018. These are indeed great phones for the money but the Hot 6 Pro ends up being the better phone between the two.